Look, the climate is not in great shape. This isn’t a big revelation. The glaciers are falling apart. The bees are dying. Something bad is definitely going down in the rainforests. 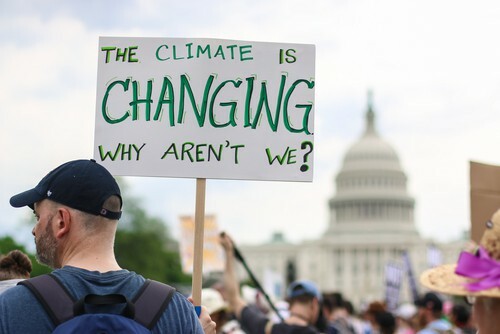 The clock is ticking on climate change and several decades of apathy haven’t exactly helped, but today, a few members of Congress are introducing a bold plan called the Green New Deal in an attempt to slam the breaks on the United States’ contribution to climate change. Here are the details. Ocasio-Cortez has gained an enormous amount of attention as the face of the proposal, but the ideas of the Green New Deal predate her by almost two decades, and have been proposed in places like the San Francisco Chronicle and the New York Times. A version of these ideas was even included in President Barack Obama’s 2009 stimulus. The policy changes picked up steam in recent years as concerns about climate change became more mainstream. The Green New Deal would have large ramifications for everything from energy generation to transportation. It also aims to supplement its changes by creating jobs in innovative sectors for minorities and low-income groups who may be disproportionately affected by the proposed changes. Now, this is a non-binding resolution, so even if Congress passes the Green New Deal, nothing would necessarily happen besides a broad affirmation of the general aims. Its advocates agree, however, that even the bill’s odds of passing are on par with a snowball’s chance in our planet’s rapidly expanding deserts. For starters, the Green New Deal is sponsored by some of the House’s most progressive members, which is sure to set off some partisan infighting. Even Republicans who have expressed concern about climate change, like Florida Representative Francis Rooney, aren’t feeling the Green New Deal. More moderate Democrats like Speaker Nancy Pelosi have expressed skepticism as well (“the green dream or whatever they call it,” she told Politico). The gains Democrats earned in Congress in November’s midterm elections were largely carried by centrists who will most likely be nervous about backing policies as bold as those proposed in the Green New Deal. The bill’s supporters say big problems require big solutions. The thinking goes if the United States had taken climate change seriously back when it was first theorized as a looming problem (an eerily prescient New York Times piece foresaw the ugly consequences of fossil fuels way back in 1956), more incremental changes could have been tolerated. But several decades of inaction mean the proposed solutions have to be bold ones. It’s the difference between tapping the breaks when you’re 100 yards from a cliff and slamming on them when you’re 25 yards away. So, yeah, the Green New Deal will almost certainly go nowhere. But the bill’s supporters hope that by proposing impossibly ambitious policies, future measures might be willing to meet them halfway. If your goal is to be responsible with the planet, you might as well dream big while staying in line with the commands given to us by God in the Bible. That’s a line of biblically sound logic Ocasio-Cortez is pretty familiar with.